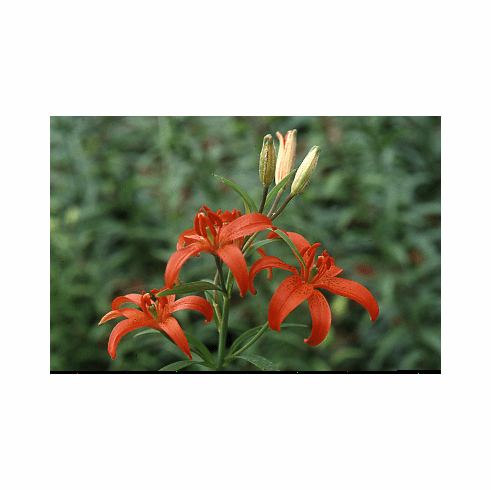 From central and south China, and to a lesser extent Japan, the small upright unspotted flowers of Lilium concolor are brilliant orange-scarlet in color. Though usually short lived in the garden, it readily sets immediate epigeal seed that germinate rapidly. Flowers in June and July on stems that run from 24 to 36 inches (30 to 90 cms) tall with seed ripening in mid September. Best suited to the well drained rock garden, sow seed yearly to insure continued bloom, but always hold some back in the freezer just in case. This wild lily likes to be kept just barely moist, resents being wet, and responds to over watering by simply rotting.